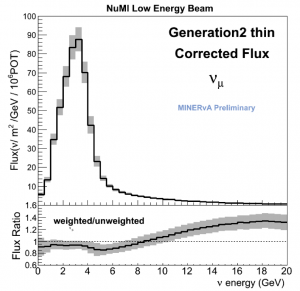 The top plot shows the new prediction from the MINERvA experiment of the flux of neutrinos that reach the detector. The flux is given in units of neutrinos per square meter per GeV for every 1 million protons that hit the target, which is located 1 kilometer upstream of the detector itself. The bottom plot shows the ratio between the new prediction and what the prediction would have been if we used only the simulation (called GEANT) and did not take into account measurements from other experiments. How many neutrinos are in the Main Injector neutrino (NuMI) beam? We might already well know if creating a beam of neutrinos were as simple as loading them into a sling shot and firing them off one by one. But with such tiny mass and no electric charge, the elusive neutrino can’t be herded into a sling shot. 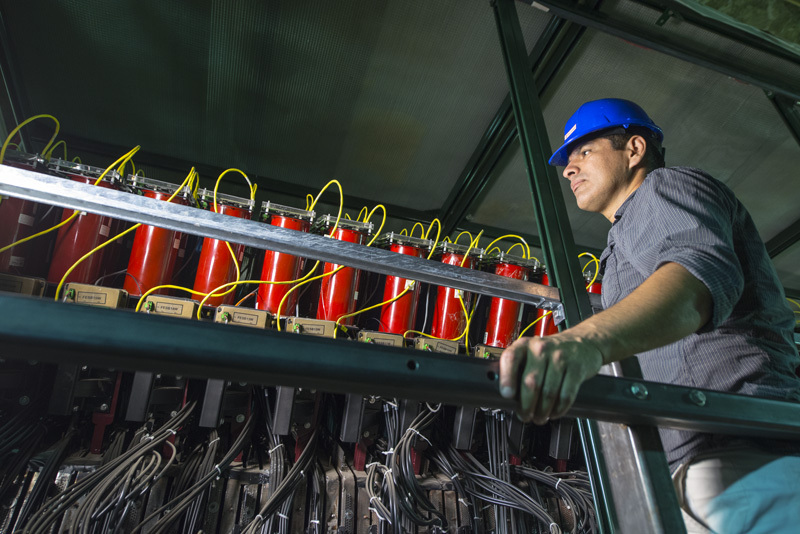 Instead, making a neutrino beam is a multistep process. First, like out of a shotgun, a batch of protons is fired toward a target of carbon. From the proton-carbon collision, debris particles such as pions and kaons are ejected and steered straight by magnetic fields. Finally, some of those debris particles decay into neutrinos, to be caught in a detector down the line. But simulating the details of this process — how much of what type of debris is created in the proton-carbon collision and might the debris reinteract with the magnetic horns — turns out to be very difficult task. As a result, predictions of the neutrino flux (the number of neutrinos) in the NuMI beam have had high uncertainties. This has been a big problem for NuMI experiments whose results rely on precise flux estimates. Currently, many measurements have an uncertainty that is dominated by imperfect knowledge of the flux. The success of future long-baseline oscillation experiments demands improved flux knowledge. At the Dec. 18 wine and cheese seminar, MINERvA presented the results of a massive effort to upgrade its NuMI beam simulation. Leo Aliaga of the College of William and Mary discussed three primary improvements of the new “Gen 2” flux. First, the geometry simulation of the NuMI target and focusing horns has been refined, and a simulation of a water later on the magnetic horns (which keeps them from overheating) has been included. Second, MINERvA uses as much external data as it can find from experiments that measure what happens when protons or other particles of known energies hit thin targets of the same material that is in the NuMI beamline (carbon and aluminum, for example). Hadron production data is used to correct how much of what type of hadronic “debris” is created in the proton-target collision. And third, the whole simulation has been developed into a free and open Package to Predict the Flux (PPFX) to model the neutrino flux not only for MINERvA, but for the other NuMI experiments as well. The techniques of PPFX and MINERvA’s Gen 2 flux can be used for any conventional NuMI-like beam. Flux predictions with reduced error bands were shown for MINERvA, NOvA and MicroBooNE. Ben Messerly is a scientist at the University of Pittsburgh.